Last month, Keith Olbermann explained in a Washington Post piece that he could no longer live in his Trump-branded New York apartment building. “I’m getting out because of the degree to which the very name ‘Trump’ has degraded the public discourse and the nation itself,” he wrote. He was serious: Olbermann did indeed move out of the building, which is managed by the Trump Organization, in March, and he’s listed the apartment for sale for $3.9 million. Olbermann bought the 40th-floor, roughly 1,750-square-foot apartment in 2007 for $4.2 million, but told the paper that while he’d be disappointed to sell it for a loss, doing so would be worth it. 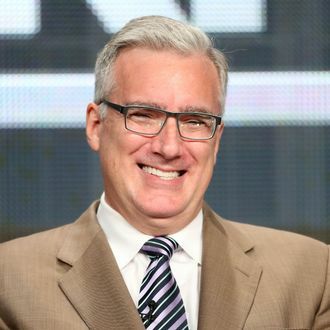 “I feel 20 pounds lighter since I left,” Olbermann told The Wall Street Journal. The apartment has views of the Empire State Building, Central Park, and the George Washington Bridge, as well as three balconies. Olbermann also got in a zinger to the Journal, explaining that he’d never have moved if it wasn’t a Trump building. “If they had changed the name of it to something more positive like Ebola Palace I would have happily stayed,” he said.